Given the photo above, perhaps this post would have been better suited to April Fools’ Day. However, since April 1st was the first day we had back in Ithaca, the precise editing required to keep the photo PG-rated would have been rushed and the result would have been, shall we say, sloppy. Although it may seem like a strange way of saying thanks, this post — and especially the header photo — are a token of our great appreciation for the folks at nākd (Nature Balance Foods), particularly for Traci in US operations, who coordinated everything with us! I should clarify that we created the photo above of our own volition and without any explicit sponsorship — it is not a nākd photo shoot, it’s just a naked photo shoot. On the trail up to Blue Mountain Peak, the highest summit in Jamaica. 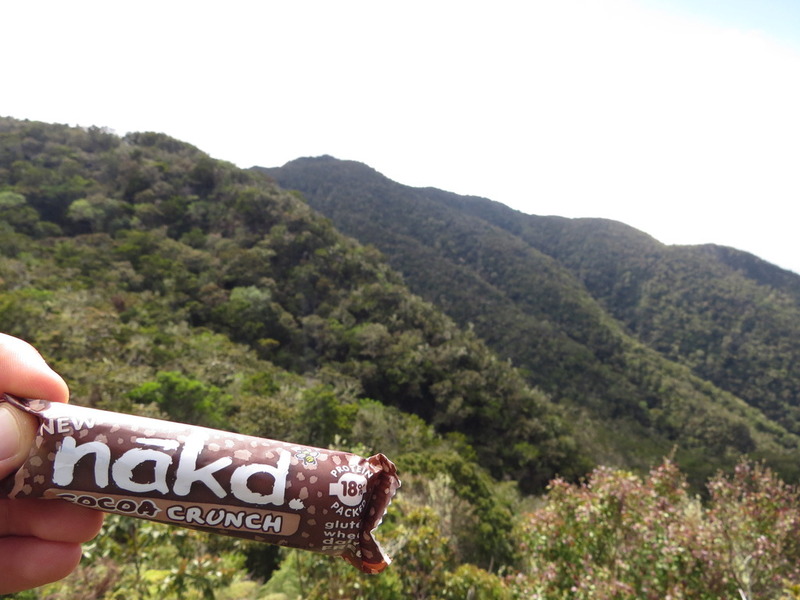 We had mentioned long ago that we were receiving lots of nākd bars to help us through our expeditions, and no amount of expressed gratitude can reflect the true value of these snacks to our diet during the past three months. The best part is that we could eat as many as we felt like it since they have no added sugar or artificial ingredients, and are basically just a combination of 1) dates and/or raisins, 2) almonds, cashews, or pecans, and 3) spices or natural flavoring like cocoa powder or coffee. Our staples for the first trip were apple crunch, cocoa mint, and cocoa crunch. Since the apple crunch were the least numerous and — in my opinion — the best by far of the three flavors, I enforced a ration of one apple crunch per person every other day, which resulted in a celebratory surplus at the end of the trip. In the meantime, John only ever ate cocoa mint, snubbing other flavors. Justin ate whatever we handed him while driving. 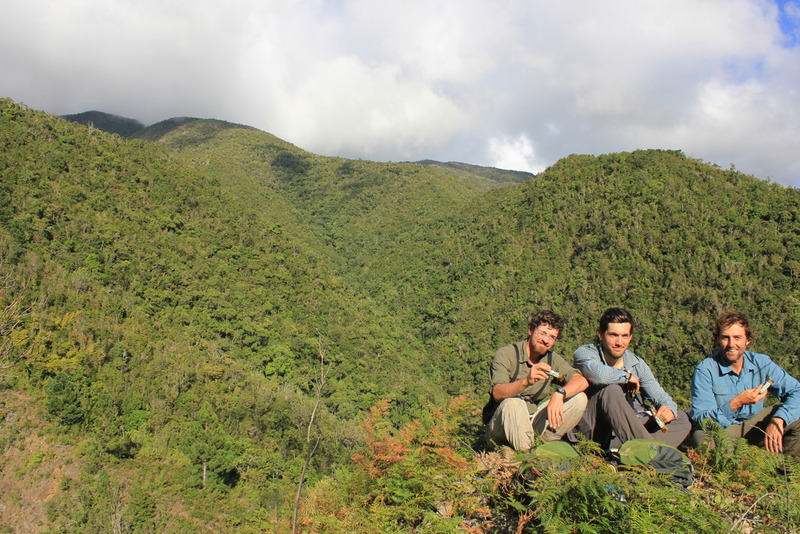 John, Seth, and Justin in the Blue Mountains near Cinchona Botanical Gardens, about to enjoy their nākd bars (photo by Justin Proctor). On the second trip we had practically no apple crunches, and a dwindling supply of cocoa crunch that was replaced with the somewhat dreaded caffé mocha. This flavor was unanimously voted the ugly duckling of the bunch — still cherished somewhere deep in some part of our minds, but shunned by the majority of our taste buds, partly because the caffé mochas tend to be drier bars but also because none of us particularly care for coffee-flavored things that aren’t the unadulterated beverage. The bright side is that many of the Jamaicans with whom we shared nākd bars loved the caffé mochas and were very happy to take them off our hands if we had a surplus for the week. And now that we’re back in Ithaca we can share the extra caffé mochas we still have with friends at Cornell. Eating two or three of these tasty gluten-free snacks a day made it easier for us to be on the go throughout our work, stopping only for lunch. 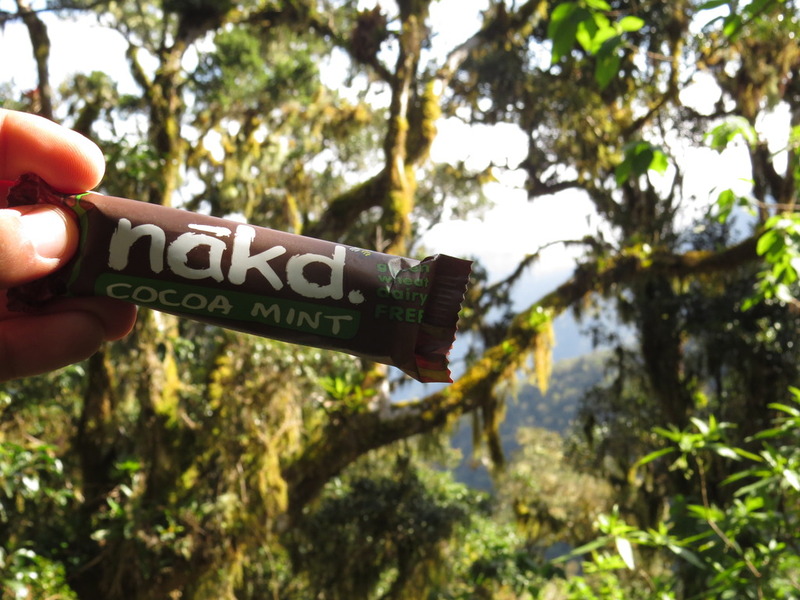 The fact that nākd bars are also dairy-free and made with raw, dried fruits and nuts meant we didn’t have to worry about them spoiling at all in the Jamaican heat, even when left in a huge bag in our car’s trunk for a month. Thanks again to the nākd team for helping us work hard and stay healthy! ← Rosario Dawson, When You Come Back To Ghana, Come To Zaina Lodge!